The not-so-sweet truth about sugar. Plus, smart ways to lower your sugar intake. Sugar does absolutely nothing for our waistline (ditto for our teeth); it has no real nutrition, and recent studies have linked excess sugar consumption to health problems such as obesity, diabetes and increased triglyceride levels, which can up your heart attack risk. And some experts believe that high fructose corn syrup -- the man-made super-sweetener found in many processed foods -- is especially bad because it tastes sweeter than other forms of sugar, which may condition us to crave ever-sweeter foods. Don't add sugar to foods and drinks. Having your coffee, tea and cereals sans sugar is the easiest way to reduce your sugar intake. Too bland for your liking? Try flavoring up with natural sweeteners such as cinnamon and vanilla instead. Cut back on processed and packaged foods like dried fruits and cookies which are typically laden with added sugar. Opt for natural fresh foods (fruits, veggies, meats) and cook them your. Don't be misled by 'healthy' sugars. All sugars are sugars. Brown or raw sugar isn't any healthier than others. Read food labels to find out if a product contains added sugars. Look out for the words "high-fructose corn syrup", "corn syrup", "fruit juice concentrate", "cane sugar", "brown sugar", "raw sugar". Track your sugar intake. Look up the "total sugars" on the nutrition label and divide that number by four -- that's the number of teaspoons of sugar you're consuming. Go for unsweetened, whole-grain cereals. Even some 'healthy' cereals can contain added sugar. Shop for your breakfast cereals carefully by looking at their ingredient lists. Cut back on sodas and soft drinks. 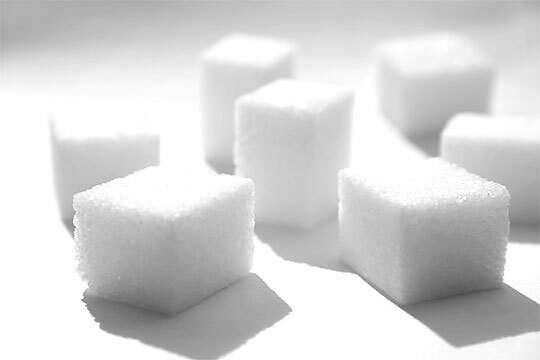 They're basically just liquid sugar -- one average can contains about 10 teaspoons of sugar! Trade juice drinks and "fruit flavored" beverages (packed with sugar and no real fruit juice) for 100 percent fruit juice. Buy plain yogurt and toss in real fruits, instead of eating fruit-flavored yogurts. Watch out for fat-free products. These may look healthier than their regular versions, but manufacturers often add extra sugar to make them palatable. If in doubt, always check the nutrition label.